The capital of Mongolia is Ulan Bator (the translation from Mongolian to the Latin alphabet is also often spelled as 'Ulaan Baatar', many visiting foreingers simply refer to it as 'U.B.'). 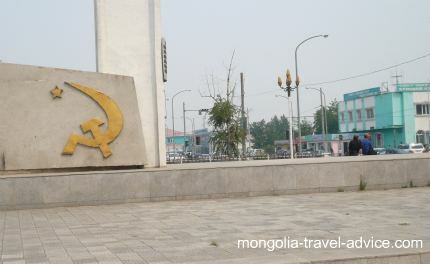 Ulan Bator means 'Red Hero' in Mongolian. Ulan Bator lies in the centre of the country, and has a population of about 1.2 million people. Due to the city's altitude and dry, continental climate, Ulan Bator is the world's coldest capital city. The city began its existence as a bunch of yurts (i.e. Mongolian felt tents) and only really started building up with Soviet aid during the communist era from 1922. Soviet-style concrete buildings still dominate the Ulan Bator's skyline. 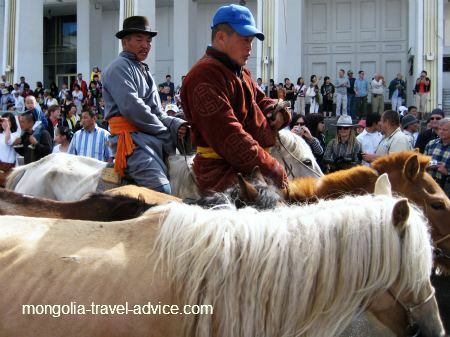 If you're interested in learning about Ulan Bator in more detail, visit my visitor's guide to Ulan Bator. Sukbaatar Square, the center of Ulan Bator -Mongolia's capital.